According to a new study, an implantable brain device that precisely melts away at a pre-programmed speed reduces damage to tissue that is otherwise seen in traditional electrode implantation. The research was headed by scientists from the Perelman School of Medicine at the University of Pennsylvania. The results of the study have been reported online in Nature Materials, where the team described a novel technology that delivers improved resolution to quantify electrical activity in time and space that either matches or surpasses current techniques. 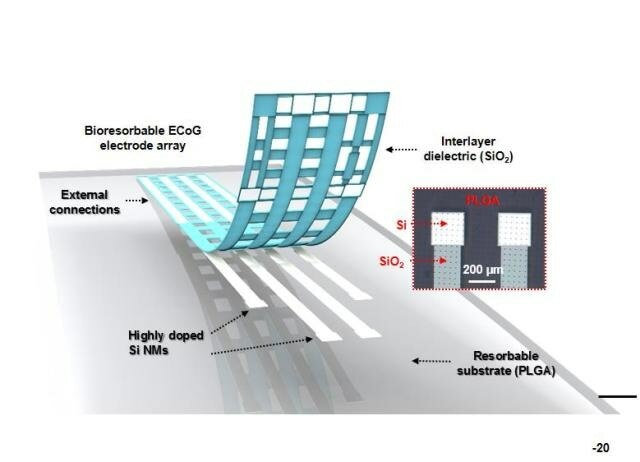 Dissolvable silicon electronics offer an unprecedented opportunity to implant advanced monitoring systems that eliminate the risks, cost, and discomfort associated with surgery to extract current devices used for post-operative monitoring. This study tested the usefulness of temporary, dissolvable monitoring systems capable of providing continuous streams of data for guiding medical care over predetermined periods of time -- from days to months -- before dissolving. Litt co-headed the study with John A. Rogers, PhD, a material scientist from the University of Illinois at Urbana-Champaign and a long-time collaborator. The novel device is made of layers of molybdenum and silicon that is capable of determining physiological properties and dissolving at a known specified speed, determined based on its level of thickness. The researchers utilized the device to document brain waves in anesthetized rats. They also recorded current fluctuations between neurons (EEGs), and promoted epileptic spikes in a live intact tissue. In another experiment, the researchers used an intricate, multiplexed array, which was made from these materials. This array can map the sensing capabilities of rat-whiskers at high resolution. They then recorded electrophysiological signals from devices that were located at the brain cortex surface and the internal space between the skull and scalp. Acute experiments demonstrated the operations of device over three to four hours, while chronic measurements were carried out over a period of 30 days. The kind of neurophysiologic characteristics determined by the new device are generally employed for diagnosing and treating Parkinson's disease, epilepsy, chronic pain, depression, disorders of the peripheral nervous system, and other medical conditions. These measurements are critically important for mapping and monitoring brain function during and in preparation for neurosurgery, for assisting in device placement, such as for Parkinson's disease, and for guiding surgical procedures on complex, interconnected nerve structures. Other applications comprise post-operative observation and recording of physiological feature following minimally invasive placement of orthopaedic, cardiac, neural, and vascular devices. Post-operative monitoring is currently based on interventional radiology or clinical examination, which is costly, invasive, and unfeasible for constant observation that could stretch from days to months. Comparative studies have demonstrated that in terms of performance, the novel sensor performed just as well or better than that of traditional electrodes that are utilized in clinics, with respect to tissue reactivity as determined by tissue pathology and immune and cellular staining towards the end of studies. According to the team, this new technology can be used in many potential applications. We also want to develop this implant to monitor post-operative seizures and recovery of brain function after surgery Recent evidence suggests that up to three months of intracranial recording may be required to adequately locate seizures before epilepsy surgery or device placement. This is a period of time that is prohibitively long for existing in-hospital approaches. Using our dissolvable electrodes for this situation would eliminate the danger and cost of removing electrodes. Brain and heart surgeons could use these devices for applications like embolization, stent placement, aneurysm coiling, and endoscopic procedures. The devices may also be used for tracking structures, which are exposed during surgical procedures but are too delicate to disturb following initial procedures to remove devices. At present, post-procedure monitoring is remotely being carried out from surgical locations, with inconsistent results. The researchers are planning to develop more complicated devices that comprise measurement capabilities like pressure, flow, electrical recording, etc., and will try out these devices on animal disease models and then move on to human trial testing. Co-authors of the study are Ki Jun Yu, Duygu Kuzum, Suk-Won Hwang, Bong Hoon Kim, Halvor Juul, Nam Heon Kim, Sang Min Won, Ken Chiang, Michael Trumpis, Andrew G. Richardson, Huanyu Cheng,Hui Fang, Marissa Thompson, Hank Bink, Delia Talos, Kyung Jin Seo, Hee Nam Lee, Seung-Kyun Kang, Jae-Hwan Kim, Jung Yup Lee, Younggang Huang, Frances E. Jensen, Marc A. Dichter, and Timothy H. Lucas. The study was supported by the Defense Advanced Research Projects Agency, a T32- Brain Injury Research Training Grant (5T32NS043126-12), the Penn Medicine Neuroscience Center, the Mirowski Family Foundation, and by Neil and Barbara Smit.